Typically Ashlar designs are squares and rectangles either randomly or following a specific patter. A classic that dates back to the 12th century and is found in most western architecture, Ashlars are most common out of all patterns. We offer a variety of background choices such as New England Slate, Old Granite, and Roman Slate, Italian Slate, Blue stone, Travertine and Quarry stone. We offer several options in our Cobblestone patterns, such as Cut stone Cobble. 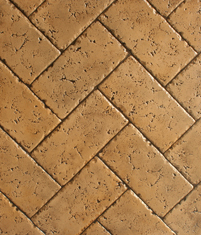 Cut stone Cobble is our most popular pattern in this category. Cobblestones date back centuries, remodeled from the water-worn round cobbles to the flat slate typically seen today. These elegant stones romanticize the old world bringing part of the past to the present and hopefully into the future. Classic Brick has been used throughout history and is still very popular today. Across many civilizations spanning centuries, brick has been a constant in our world. Our brick patterns give the option between older looking brick and newer looking brick. Proline is the innovator of the Seamless Texturing system. All others are imitations of the original. All Proline skins are made of the highest grade urethane in a unique process that results in highly durable stamping tools. This sedimentary rock gets split into sheets and cut into shape to make some of the finest roofing as seen on many cathedrals still today. Although this has been used for roofing throughout the years, among other things, we have produced several Slate stamping mats to help dreams come true. We offer many different textures and sizes in our tiles category. Tiling with individual tiles can be a grueling process in which tiles can be broken, scratched or stained. This is simply not the case with stamped concrete. Take a look here for all of our simple designs made to exemplify tiling for everyone. Tumbled Travertine can be grouted for added detail and beauty. The recessed grout lines and texture protect the antiquing, allowing the installer the choice of no sealer, making it perfect around swimming pools for less slippage. By far the Boardwalk 6” with nails is the most used stamp in our entire collection. Our most prideful wood grain is the Reclaimed Timber stamps made to replicate authentic Reclaimed Timber.